Book review: "The Hotel Detective"
This review first appeared in the North County Blade-Citizen (now North County Times) in 1994. Like Raymond Chandler and Sue Grafton, Cardiff's Alan Russell creates quintessentially Californian mysteries. His first two novels featured the exploits of San Francisco private eye Stuart Winter. His latest, "The Hotel Detective," introduces aging surfer and budding hotel detective Am Caulfield. Caulfield is the assistant manager of a (fictitious) world-renowned La Jolla resort hotel of the class of the Hotel del Coronado. When the security chief quits, Caulfield inherits the job  along with a suicide, a double murder and a rash of stolen bras. At first, Caulfield hardly appears up to the challenge. He's a lifelong Southern Californian, a surfer by nature, with an old '50s woody station wagon to boot. But beneath the relaxed exterior is a strong will. As the story progresses, Caulfield shows himself to be resourceful and focused. Those from or familiar with San Diego County will especially enjoy the book. 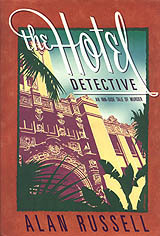 "The Hotel Detective" captures the essence of San Diego better than any work since Max Miller was on the scene. Am Caulfield is an aficionado of taking in dusk at Sunset Cliffs and enjoying the beauty of La Jolla Cove. Russell never gushes over the region, but his love for the area is clearly expressed. This is a fast-paced novel; perhaps too fast-paced. The plot moves along at full speed, never slowing. With this book, Russell seems to be still developing a touch for lingering over a scene, for allowing suspense to build while also allowing readers a chance to savor a particular passage. Still, in "The Hotel Detective" Russell shows glimpses of greatness. He eschews the stereotypes usually found in mysteries and instead creates characters you would only find in Southern California. His plot is unpredictable and fresh. If he learns to slow down, to allow a scene to brew rather than boil, he has the ability to join the ranks of Chandler and Dashiell Hammett in straddling the line between mystery and literature. For now, Russell is already in very good company. "The Hotel Detective" works because Russell resists the temptation to go for overkill. Like Tony Hillerman and Grafton, Russell has created characters we can care about, whom we want to visit again.